Introducing the AlphaÃ‚Â® AIR-300, designed for unique applications that are difficult to accomplish using conventional polishers. A smaller version of the well-known AlphaÃ‚Â® AIR-658, the AIR-300 is ergonomically designed to fit comfortably in your hand and only weighs 1.6 pounds reducing fatigue from long hours of polishing. The smaller design is easy to maneuver and produces flawless sink rims and bowls. The AlphaÃ‚Â® AIR-300 accepts 3 and 4 discs along with 2 and 3 rubber pads. 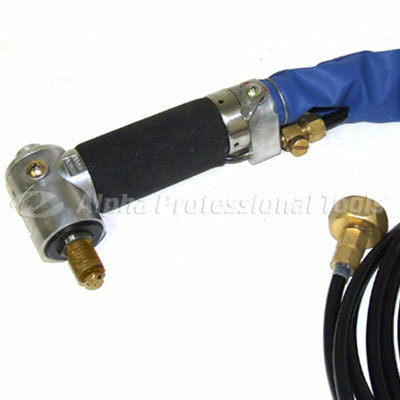 It requires a 3HP compressor with air consumption of 10 CFM and air pressure between 8595 PSI. The AlphaÃ‚Â® AIR-300 Polisher easily converts from in-shop to on-site; a must have for all fabricators!